Treating Tarsal Coalition In Children and Teens | Podiatry Associates, P.C. Bridges cross gaps to join separated pieces. This can be very helpful. After all, it allows you to drive over rivers or cross gorges. Bridging parts that need to be separate to move can be a problem, however. This is the issue that teens face in their feet with tarsal coalition—a “bridge” of sorts between separate bones. Tarsal coalition is a problem with an abnormal bar or bridge of tissue that grows between and connects what should be two separate bones in the back and middle of the foot. This bridge is usually made from bone, cartilage, or other fibrous tissue, and forms before a baby is born. It generally connects two of the seven tarsal bones in the arch or back of your foot—the calcaneus, talus, navicular, cuboid, and three cuneiform bones. These bones normally don’t move much, but they do glide against each other somewhat so your arch will flatten slightly under pressure. This slight flattening allows it to absorb the shock and the weight of your footsteps. A stiff bridge of tissue between two bones, however, will prevent even this slight motion, stiffening the whole foot and causing pain. Even though the bar of tissue between two tarsals is present from birth, it usually doesn’t cause a child pain or problems until he or she is older. In a young child, the tissue bridge is relatively soft and flexible. This allows the tarsal bones to glide as they need. When the bones in the feet begin to mature in adolescence, however, the cartilage and bone hardens—and the tissue bridge hardens along with everything else. This limits the motion in the arch and back of your teen’s foot. Over time, this grows increasingly painful for your son or daughter. He or she will develop rigidly flat feet. Standing and walking around will feel more uncomfortable. Walking on uneven surfaces may be more difficult as well, which leaves your child’s ankle more vulnerable to sprains. Strenuous activity can even inspire a limp. Fortunately, like other forms of flat feet, this condition can usually be treated conservatively. Our team of experts at Podiatry Associates, P.C. will carefully examine the stiff feet and evaluate the arch and range of motion. 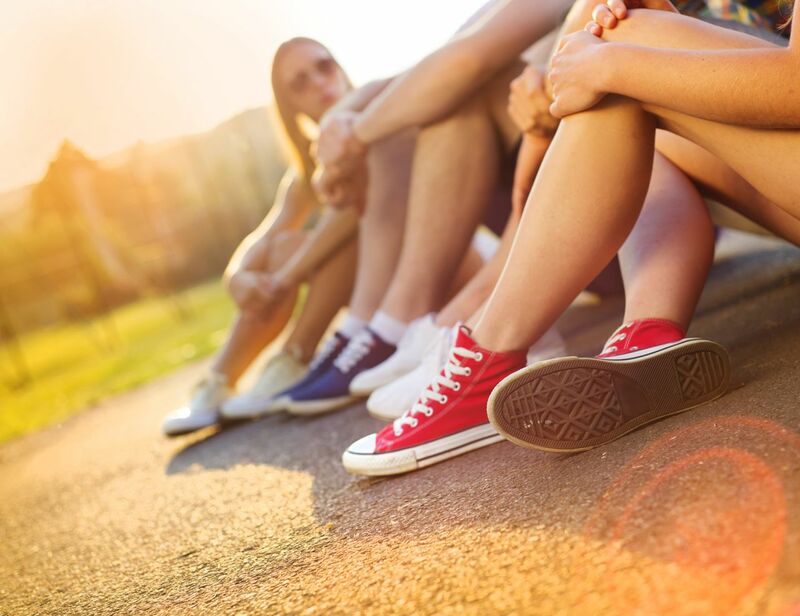 We will need diagnostic images to see the problematic tissue in your teen’s lower limbs. Then we can help your son or daughter alleviate the pressure. Reducing the stress on your teen’s painful feet is the most important step. Your child will need to take a break from hard impact activities that hurt his or her feet. This allows the inflammation and stress in the bones to decrease, alleviating pain and healing any bone damage. More serious cases might actually need to have the foot immobilized in a boot or a cast. Most likely your child will need to wear custom orthotics that support the arch and direct pressure away from it. This stabilizes and cushions the foot, controlling the discomfort. We may recommend anti-inflammatory medications for the pain as well. In some cases, teens may actually benefit from direct injections of pain medicines. Surgery becomes an option when conservative methods don’t help alleviate discomfort or improve foot function. Tarsal coalition can make normal activities like walking and even standing difficult and uncomfortable for your teenager. The sooner you have the problem dealt with, the sooner your son or daughter can alleviate the discomfort and enjoy activities again. Let our team at Podiatry Associates, P.C. in Parker and Castle Pines, CO, help you with this. Make an appointment today by calling (303) 805-5156, or by using our online request form.